The Rocky Mountaineer is getting some “new” cars. On January 21, 2019 I spotted this pair of cars in Symington Yard in Winnipeg, Manitoba. 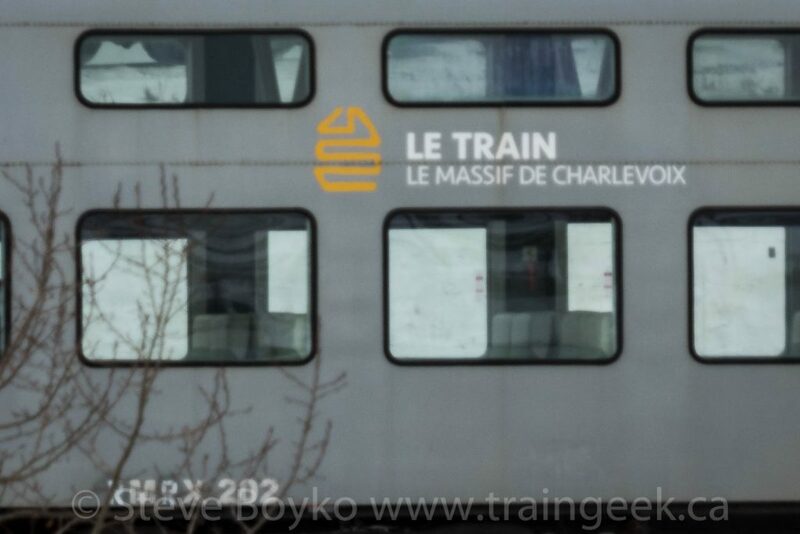 I recognized these cars as belonging to the Charlevoix tourist train operation in Quebec. The “RMRX” reporting marks on these two cars (RMRX 201 and 202) told me that these now belonged to Rocky Mountain Railtours, the owners of the Rocky Mountaineer. The Charlevoix tourist operation was purchased by Group le Massif in 2008. Previously it was a shortline, le Chemin de fer de Charlevoix (CFC). Group le Massif operated a ski mountain and wanted to run a tourist train. They purchased two ex New Brunswick East Coast Railway RS-18 locomotives, NBEC 1821 and NBEC 1868, to pull the train. I guess that didn’t work out, as the conventional passenger train has been replaced by two pairs of DB Class 628.1 diesel multiple unit (DMU) self-propelled cars. Train de Charleoix self-propelled cars. Photo by Brad Fagan. These cars are former Southern Pacific Pullman bilevel cars. They were refurbished and the second level was removed. Photos I’ve seen of the interiors show a very open car, with some reinforcing beams in the upper portion and lots of light through the large windows. I imagine that’s why the new owners were interested in them. This video gives you the “onboard experience” of those cars, plus a few exterior views while they were in service. There is writing on the side of the cars, from the poem “Complot d’enfants” (Plot of Children) by Canadian singer-songwriter Félix Leclerc. “Nous partirons seuls, loin, pendant que nos parents dorment. Nous prendrons le chemin, nous prendrons notre enfance, un peu d’eau et de pain et beaucoup d’espérance. Nous sortirons par l’horizon.” My rough interpretation is that it is a plan by children to sneak out (taking some bread and water) and go exploring the world. I spotted two more of these cars on January 29 in Symington – RMRX 405 and a generator car, RMRX 302. The large vents on the side, and mufflers on the roof, show that RMRX 302 is a generator car. Notice the emergency cutoff valve to the right of the rightmost vent. The Rocky Mountaineer already runs generator cars with its current passenger trains, so this will look right at home. I reached out to Rocky Mountain Railtours via their Twitter account and they confirmed these were on the way to Kamloops. 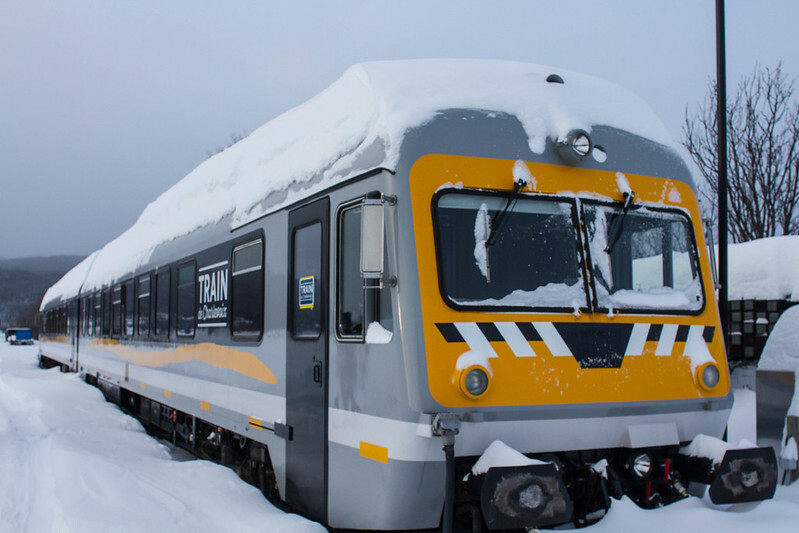 My 2014 Canadian Trackside Guide says they had 10 cars – two cab-coaches, two generators, and six coaches, probably organized into two trainsets. Most of the cars were built for the Chicago & Northwestern, then went to METRA, the Chicago commuter rail organization. The two generator cars were built for CN, then ran on VIA and then Amtrak. I’m excited to see these cars in service, once they have been repainted and refurbished for the Rocky! I am currently reading On Photography by Susan Sontag. It is a very thought-provoking series of essays on photography by the acclaimed American writer. Expect to see some quotes from her soon!